They're hybrid fruits or interspecifics: A cross between a plum and an plumcot—which are also a plum-apricot mix with a tendency to swing more on the side of the apricot family. They look like plums and are apparently super sweet; each one contains about eight grams of sugar, which is more than either a plum or an apricot by itself. However, some people are suspicious of hybrid fruits because they believe that “engineered” fruits are out of balance. The exaggerated sweetness of the Pluot is potential example of an unbalanced fruit. Critics claim that these fruits are not “natural” and lack many of the health benefits of “normal,” non-engineered fruits. This claim overlooks that plant hybridization has been occurring without human intervention for a long time. You don’t need to be Mendel to appreciate this either. Plant some red and white tulip bulbs in your garden or window box this fall, and in the spring you’ll have red and white tulips. However, the following spring may yield some interesting colorings: white with red stripes, red with white stripes—add other colors and things really start to get interesting. Personally, this idea of “engineered” fruits makes me think of frankenberries and other possible monstrosities. And that doesn’t seem to be what is actually happening here. Pluots have been around since the 1980s. They were bred and trademarked by Floyd Zaiger of Zaiger’s Genetics. The plumcot, a parent in this process, made its appearance in the 19th century thanks to the efforts of horticulturalist Luther Burbank. Farmers have long crossed plant species to make them viable. It’s the reason we have so many varieties of apples and oranges. Wheat, for example, hybridized in the wild long before humans got involved. When humans did get involved, they crossed plants to create hardier strains. Zaiger Genetics has developed more than twenty varieties of Pluots. Each new variety has a different percentage of plum and apricot genes and can take on surprising appearances. For example, the popular Dinosaur Egg variety is large with mottled pale green to yellow, red-spotted skin, and red or pink juicy flesh; they are also known as the Dapple Dandy. Perhaps you’ve had one? Early Queen variety of Pluots. When grown by Kingsburg Orchards, they're called Dinosaur brand fruit; when grown by their Reedley, Calif.-based competitor, Family Tree Farms (owned by another branch of the same family, the Jacksons), they're called plumcots (which, strictly speaking, should refer only to 50/50 crosses). Family Tree needed to make the change, says Don Goforth, the company's marketing director, because, along with the Zaiger fruits, it was selling as Pluots many interspecific plums from BQ Genetics, and it did not want to infringe on the Zaiger trademark. Sometimes names can even obscure the genetics of a fruit. In the last five years, Kingsburg Orchards has introduced six varieties of colored hybrids, now planted on hundreds of acres and marketed as Velvet apricots. But Black Velvet, which has dark, fuzzy skin and yellow flesh, is a true plumcot, whereas the gorgeous Gold Velvet is genetically a cross between a peach, an apricot and a plum. This same fruit, when marketed by Family Tree, is called an Aprium (actually, Zaiger's trademarked name for apricot-plum hybrids with apricot character predominant), and Dave Wilson Nursery licenses the variety as a Peacotum. Rather than pollinating his experimental trees from a single flower in the traditional way, Glen Bradford of BQ Genetics places a bouquet of several different promising pollen parents in buckets in his mother trees, and which pollen ends up on which flower, only the bees know. What’s your take on hybrid fruits? Do you have any yummy recipes for Pluots to share? 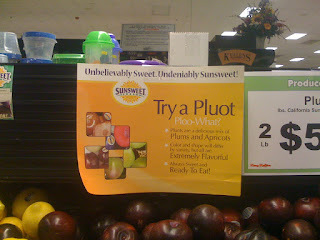 What about labeling—would you know a Pluot if you saw it? Update: So I checked the plums in my fridge, and they are all "black" pluots. 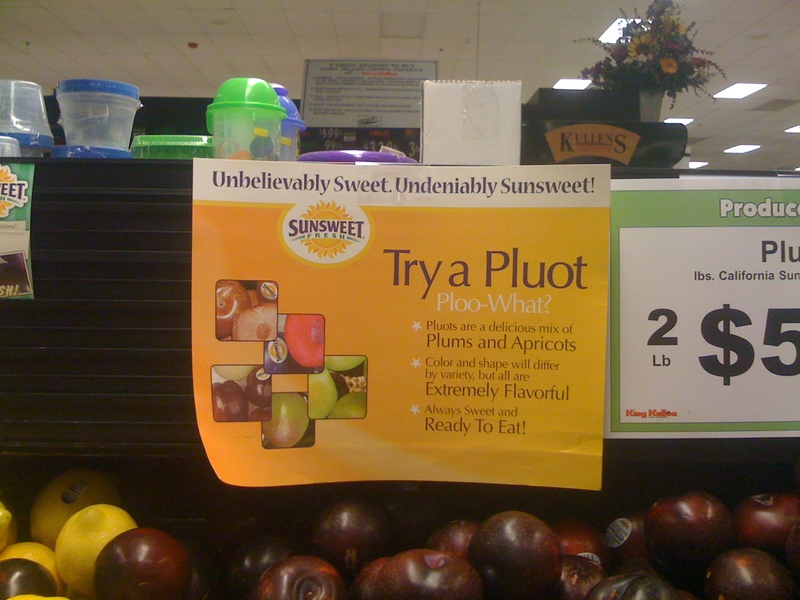 They have a sticker identifying them as pluots. I've never noticed. I've probably been a pluot eater for a long time.